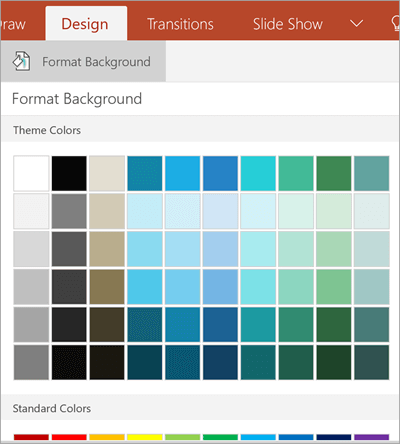 You can use your mobile device to change the theme or background color of your PowerPoint slides. On your Android tablet, tap the Design tab. On your Android phone, tap the Edit icon , tap Home, and then tap Design. Tap Themes to see a gallery of available themes. 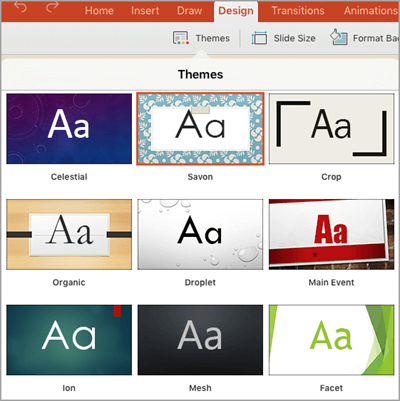 Tap a design theme to apply it to your presentation. Go to Design > Format Background. Choose a background color for your slide. To remove background formatting, select No Fill. To see more color options, select More Colors. On your iPad, tap the Design tab. On your iPhone, tap the Edit icon , tap Home, and then tap Design. Tap Themes to see a gallery of designs. Tap a design to apply it to your presentation. On the Design tab, tap Format Background. You will see the background colors divided into Theme Colors and Standard Colors. 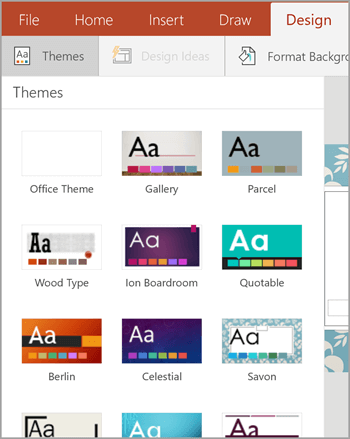 Theme colors coordinate with the theme you selected previously. You can select a solid color or a color gradient. 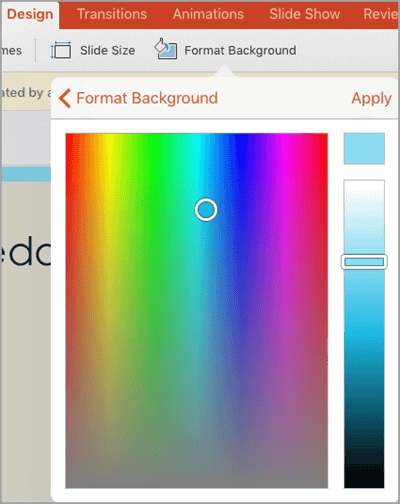 For more choices, scroll down and tap More Colors, and then move the selectors to any custom color or gradient shown. Tap Apply to apply the custom color. 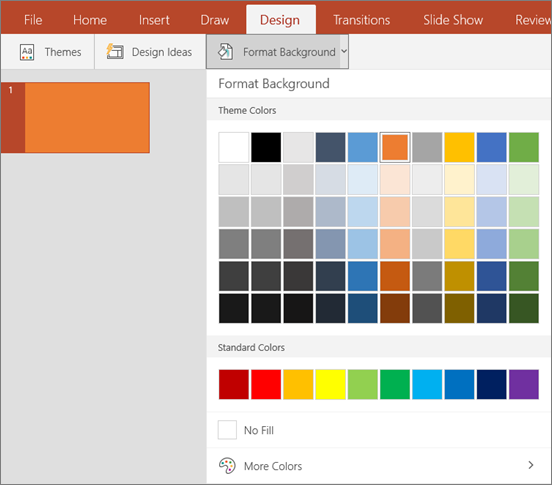 On your Windows tablet, tap the Design tab. On your Windows phone, open the slide for editing (either by double-tapping it or by tapping it and then tapping Edit). Tap More at the bottom of your screen, tap Home, and then tap Design. You will see the background colors divided into Theme Colors and Standard Colors. 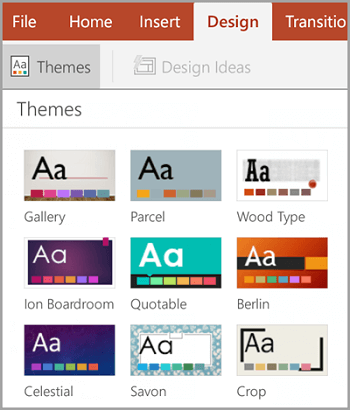 Theme colors coordinate with the theme you selected previously. 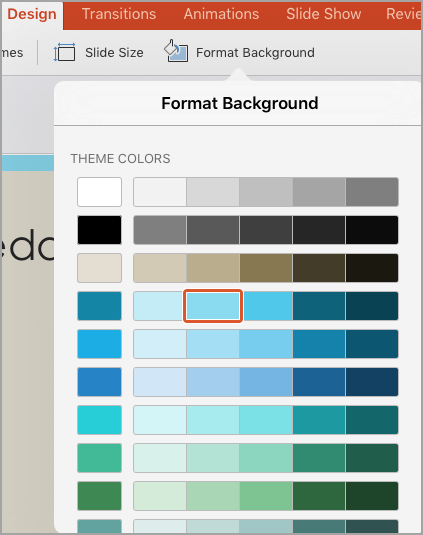 You can select a solid color or color gradient.